Sunrisers Hyderabad Team Kit 2017 IPL 10. Indian Premeir League 2017 Sunrisers Hyderabad official team kit for the upcoming season of fantasy T20 cricket league. Officials of Sunrisers Hyderabad have rvealed and launched their new kit & jersey with official logo. 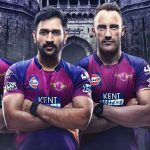 According to the newly revealed kit look Sunrisers, we have not witnessed any kind of big changes in the new kit, except of designing. This kit contains dark orange and black color on with a slightly addition of dark red and golden color. 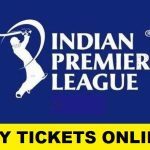 Most all the teams kits in the IPL have golden colored stripes on the different places of jerseys and trousers. 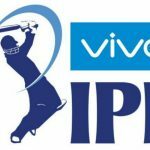 As you can see in the images that newly launched kits of IPL Hyderabad team 2017, the dark colors are every where on the kit. So this is the best thing that the owners and management of the Sunrisers Hyderabad added. Golden stripes place on the shoulders, while he sleeves are red in color. The dark orange color is present on the front side of chest. 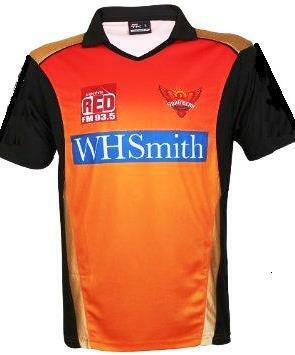 The left side of the shirt acquires logo of Sunrisers Hyderabad, while the logo or manufacturer available on the right side. Trousers fully decorated with the black color and there are stripes of orange color by the both sides of this trousers. 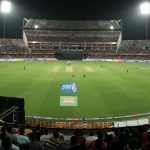 You can also buy the Sunrisers Hyderabad team kit online 2017. 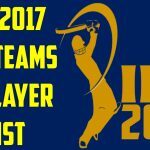 Here we have placed the best team kit of Hyderabad that are newly launched.